Flames introduce "Forever a Flame"
CALGARY, AB -- – The Calgary Flames announced today the “Forever A Flame” program which was established to honour members of the Flames organization. Al MacInnis’s selection marks the beginning of the “Forever A Flame” program, a distinction and path that will be followed by others in the future. MacInnis will receive the honour on February 27th during Al MacInnis Night at the Scotiabank Saddledome. Al will be accompanied by his family and members of the Flames alumni in a pre-game ceremony. The Flames have established a tradition that permits Flames of the future, with an opportunity to proudly wear the numbers of some of the Flames all-time greats. A special banner for the honouree will be hoisted and remain on permanent display at the Scotiabank Saddledome. “Forever A Flame” is also the beginning of an on concourse display area being created and dedicated to past and future honourees. “We are thrilled to add Al as an honouree in what will be a group of individuals who we consider to be Forever Flames,” said Flames President & CEO Ken King. MacInnis was drafted by the Flames in the first round, 15th overall, of the 1981 NHL Entry Draft. Although he played a handful of games for the Flames in both 1981-82 and 1982-83, MacInnis continued his junior career, which included a Memorial Cup championship in 1982. After spending the early part of the 1983-84 season with the CHL’s Colorado Flames, MacInnis became a full-time member of the Calgary Flames blue-line later that season, playing 51 games and scoring 11 goals and 34 assists for 45 points. While with the Flames, he played in eight All-Star Games, but more importantly, was a key component of a Stanley Cup championship for Calgary in 1989. For his contributions in the playoffs that spring, including 7 goals and 24 assists in 22 games, MacInnis was awarded the Conn Smythe Trophy. In 803 games played with the Flames, MacInnis recorded 822 points. He also holds the career franchise record for assists (609). MacInnis left Alberta having evolved into one of the top defencemen in the NHL. On November 12, 2007, MacInnis became the 10th member in the history of the Calgary Flames organization to be honoured with induction into the Hockey Hall of Fame. 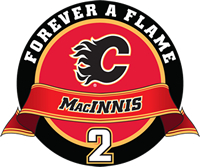 MacInnis made contributions to the Flames organization over the course of 13 seasons in Calgary and now will eternally be remembered in the hearts and memories of Flames fans forever by his induction into the “Forever A Flame” program.